The next time you walk into a meeting, take a moment to ask everyone to take out their devices. The individuals around you will produce numerous models and name brands of smartphones, tablets and other devices they use on a daily basis. In our ever-changing society, schools need to be aware and adjust to shifts taking place around them. We must believe that by empowering students and staff to utilize technology each day, we are preparing them for their future, not ours. Ultimately, it’s the vision of your board and your educators that will shape the culture and climate in your buildings. It was that type of vision that led to the successful implementation of BYOD – Bring Your Own Device – at the Northfield Community Middle School. Beginning Our BYOD Journey Four years ago, in 2012, I began my tenure as the principal of the middle school in Northfield, Atlantic County, with the vision of implementing BYOD. The school building was still relatively new, but it was missing a few vital pieces I would need. The building did not have WiFi capabilities due to a basic functioning infrastructure, and was in need of a true IT Coordinator who could help bring my vision to life. Too often, leaders are addicted to the latest “shiny gadget” and place little thought on vision, goals, and functionality. Many refer to this as “buying to just buy.” Before going to BYOD, I held multiple meetings to gain input from staff, students, and various stakeholders. I visited two schools that had BYOD programs with routers from home that were placed on desks. I used Twitter, and was able to receive various sample AUP (Acceptable Use Policy forms). Our BYOD program was designed and created based on a vision that incorporated staff and student voice. In the first year, the superintendent and I put together an AUP for our building and presented it to the board of education. However, the most crucial part was still to come. No BYOD or 1-to-1 program could be successful without proper infrastructure, and an IT coordinator willing to find a way. Our IT coordinator, Aleng Phommathep, and I worked together to update our infrastructure. In a few summer months, personally running lines and access points by hand, at a cost of about $100,000, our infrastructure was ready to support our BYOD program. We had created a seamless WiFi building for staff (125), students (1,000 at the time) and guests to have instant access to resources never available before. During the first week in September 2013, I told staff and students I trusted them, and believed in them. No one in our geographical region had yet empowered staff and/or students with BYOD, for numerous reasons. But we focused on our best instead of our worst, and provided resources to prepare for the world of tomorrow, not yesterday. BYOD/Technology in Everyday Use Three years later, our BYOD program provides valuable resources to our school community every day. Technology plays a part in every lesson at our school, to the point that it’s almost natural to not label them as BYOD lessons anymore. 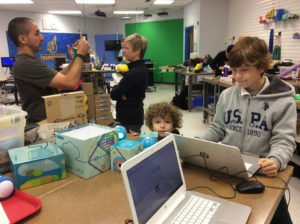 While the majority of our students jumped in to the idea, and registered their personal devices with the school, we had some families that were skeptical. Some assumed that students on their devices would lead to negative situations. We even had a few students who assumed we would be looking over their texts and phone calls, to use against them. However, as BYOD took hold, and as conversations took place in the school and community through the first few weeks, more families and students saw the enormous positive possibilities. Educational performance is enhanced by using these tools, instead of just using outdated textbooks. Communication: Student and Staff Voice Our faculty meetings have now been revamped to provide staff with meaningful professional development. I was able to “flip” the faculty meetings, so staff members read emails or watch videos from anywhere in the building, then come to meetings to work on assigned tasks. In that way, we work on tasks such as “genius hour” projects, “20 percent time” projects, PLC (Professional Learning Communities), reflection time, EdCamp sessions, group discussions of what staff are using in their classrooms, and much more. Transparency between staff and students was created too, by having students present at faculty meetings. Students provide staff with websites and apps that they use on a daily basis, which in turn allows teachers to consider using those tools in the classroom. I also created a Pinterest page; printed resources recommended to me on Twitter; and sent numerous mass emails out with multiple resource links, blog posts, and other resources so that the staff could choose, instead of being forced to create lessons where technology is infused. Gearing Up Launching BYOD has meant adding some equipment. We purchased four charging stations, with eight different adaptors each, so devices can remain charged throughout the day. Thanks to BYOD, however, we can allocate money to technology needs such as updating servers, access points, and broadband, instead of replacing PC’s for a computer lab. We also won the Samsung Solve for Tomorrow award, which provided us with 65 new Chromebooks, and purchased Chromebooks for each additional grade level, to provide equality. We placed WiFi printers in each grade wing and removed printers from classrooms, drastically reducing spending on ink and paper, and providing students and staff with a sense of ownership and oversight of what is printed. Unconventional Changes Led Students and Staff to New Heights Technology is a ubiquitous element of a larger culture of innovative, student-centered learning at Northfield, focused on the mantra “Becoming Life Ready.” The school hallways have been converted to “Idea Streets,” an innovative learning initiative modeled on a program at Stanford University “d. School.” Our school’s “Digital Shop” thrives on design thinking and projects that will better the lives of others, such as designing 3D-printed prosthetic hands for children, and working with Thomas Jefferson University medical students and doctors to create ways to improve the lives of children in pediatric units. Northfield students are given the opportunity to create video games from children’s books, and to 3D-print items that they designed. Students control their own learning pace on Northfield’s gamified learning management system. Learning is much more robust when students engage in real-world activities that serve a purpose. We believe that by empowering students and staff to utilize technology each day, we are preparing them for their future, not ours. Lastly, we created an “EdCamp” period that gives students a real voice in their learning. Students inform the staff what they would like to learn for one period a day, then lead their own sessions. Staff simply act as facilitators, and learn along with students. When is the last time you saw students running to sign up for a class? Throughout the year, students have developed video games, apps, “shark tank” products, mock trials, children’s books and other projects. Though the EdCamp period is ungraded, students produce more work during this time, and can be found documenting their projects through the use of technology. In my view, when students work off of a rubric, they work just enough to gain a certain grade; whereas, when they are sharing with the world, they are dedicated to learning everything they can about a subject, and making it perfect with their personalized touches. Through our BYOD program, the school community has seen our culture and climate change from lukewarm to exciting. The staff feels trusted, respected, and empowered to create new lessons with the same drive they had when they were in college. Students gain a sense of pride in knowing we are pushing ourselves to give them an education focusing on their futures, not our past. At a time when advanced technology is available for all ages, and can fit in the palm of any hand, many educators continue to ignore, banish, or restrict it. We have the opportunity to connect to infinite resources, worldwide communication, and tools beyond our wildest childhood imaginations, yet many embrace fear when it comes to allowing students to use it in schools. Ultimately, as educators, we must overcome our fears, become more transparent, and establish trust, respect and student voice. When students feel valued, empowered, and can engage in honest conversations, that’s where “sparks” begin to fly. Take a moment and think of a time in your life, that something or someone caused your mind to reach a state of rapture, prompting you to share with everyone. As public speaker and tech advocate Jason Silva states, “these moments are what make final cut” and create memories of a lifetime. Our students at Northfield are creating memories while they are preparing themselves for a future of innovative thinking. We need to continue to question the traditional silos that have been in place for years, because “it’s always been done that way,” and realize that authentic learning can only happen if students and staff are given a chance/voice to create their own beautiful questions. Students work in the Digital Shop at Northfield Community Middle School. Glenn Robbins, principal of Northfield Community Middle School, offers these tips for school boards and districts looking to start a BYOD program. What is the experience that your school district is trying to create for students, staff, and the community? Why are we constantly deciding what to do with our worst people, and not our best? We are 16 years into the 21st century, yet we still say 21st century skills. Why? Why do we continue to use outdated textbooks, and resources, when students and staff have access to devices that can provide instant, up-to-date information? How can we create an AUP (Acceptable Use Policy) that pertains to our school district? Are we allocating budgets properly, and how can we adjust? Why should we standardize devices in our school settings, when colleges and business do not? If a student is supplied with an Apple product, how do we really know that where he/she goes next isn’t using Android or something else? Why do we continue to make excuses or ignore technology, when we think we are providing students with the skills they need to adjust and adapt in the future? What’s holding you back from implementing a BYOD program in your school district, and how can you make a difference in addressing that? Glenn Robbins is the principal of the Northfield Community Middle School, in Northfield. Mr. Robbins was recently named as the National Association of Secondary School Principals (NASSP) National Digital Principal of the Year.